This is the second of a two part series written by 3D animator Ramy Qudmany, who shares the excruciating details of his escape from Syria and quest to reach Germany. For a better understanding of this piece, read Ramy’s Odyssey, Part I first. The fighting had already gotten intense enough where my family decided it was time to leave. Before we could escape, however, things got worse. Bombs were now falling on the area I called home and the company I had worked for was destroyed. The electricity was cut off and so was the water, which we had to carry from outside of town to survive. One day, my cousin was on the bus headed to work on a road leading the airport that both sides were fighting to control. As the bus crossed the intersection, shooting started from both sides and a bullet hit my cousin in the neck and killed him. When I heard the news, I couldn’t believe it, I thought it was a joke. I couldn’t manage, I couldn’t handle it, I just started crying. Every time I tried to talk to his mother and help her with her sadness, I would close the phone and start crying again. That last time I talked to my cousin, he said “I will call you back, and we will talk again.” Since that day I haven’t heard his voice and he’s just gone now. My older and younger brother got out of Syria first. They went to Germany so my younger brother could have surgery to fix his cleft pallet, which had been causing serious problems since childhood. The doctors in Syria were not good enough to perform the operation, but Germany was a good place to be. My parents and I had since crossed into Turkey and they filed paperwork for reunification with my brothers in Germany. Since I was older than 18, I was told I would not be able to file for reunification with my brothers, but maybe there was a small chance for me to go if I waited for my family to get their papers verified first. After waiting about a year, my parent’s request was granted and they moved to Germany. I was alone. The situation in Turkey turned out to be not much better than in Syria. First, there were protests which started over the destruction of trees in a park to make a building. They continued after a kid buying a piece of bread was killed. Explosions started to happen from time to time in Istanbul, where I was living. I started to think that the situation in Turkey would turn into what was happening in Syria. I wanted to leave, but since I was over 18, I couldn’t be granted official family reunification. Things got more difficult as time went on. Turkey prohibits Syrians from working; we are strictly in the country as guests and not given the right to have a job. We still need to support our families, pay rent and the other bills, but are not allowed to legally work. If you go to work with a company in Turkey, you have to take the job without a contract, which every company then uses as an opportunity to take advantage of you. Myself and many people I know were cheated out of months and years of pay, but since there is no contract, we can’t even sue them. My family had sent news that my father’s declining health had gotten worse and he needed heart surgery immediately. As the doctors said the chance of success was 20%, I felt myself lose my mind. Being stuck so far away in Turkey which was getting worse and more dangerous, all I wanted to do was see my father and stay with him for as long as we have time for. I tried to get to Europe the proper way by finding a job and getting sponsored for a visa. Many companies saw my 3D animation work online and invited me to join their team. However, once they found out I was Syrian, they said they could not get me a visa because of the current situation. 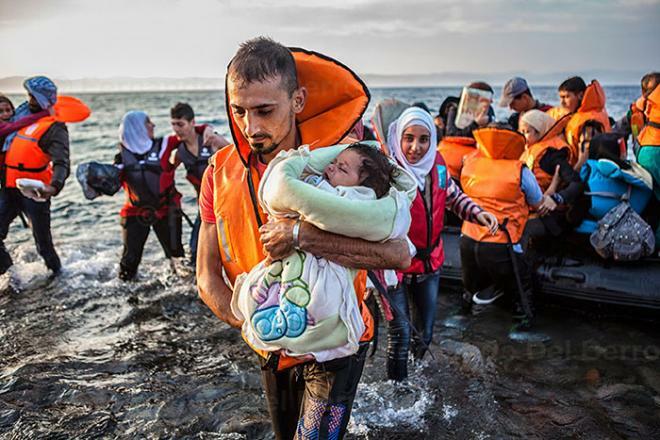 I decided to take my last option to reach my family, which meant first taking a boat to Greece. What I didn’t expect was the horrible accident that almost left me dead, sinking in the sea. I was with a group of 12 other people who I had met just the day before the trip. We stayed in one house until late in the night when we could make our crossing. I remember going to the living room seeing bodies sleeping all over the place. A four year old, sweet little angel was sitting on the floor in the glow of the TV, bored by the news being broadcast. I changed the channel to cartoons and I brought a soft blanket to keep her warm on the cold floor as I ruffled her hair before I went to sleep. At about 1:00am, smugglers took us to the location where the fast boat would arrive to take us to a Greek Island. When the boat arrived, it was something like 5 meters long, but the deal we made was for a large jetboat, so everyone thought this one would take us to another bigger one that was too big to get to this beach. At the same time, the guy who was holding the life jackets before we were switched from one car to another told us he lost them on the way. He said it would be no problem because the trip to Greece was just a safe 35 minutes away that many people before us made in the same way. We got in the boat and as we started moving toward the Greek Island, we realized we weren’t going to a bigger boat, which everyone thought was okay since the sea was calm. I was sitting in the middle on the left hand side; next to me was the family of that little girl I gave the blanket to. The mother was sitting next to me holding her son and the husband was holding his daughter, both of the kids were still sleeping. As the boat moved along with no problem, I noticed how amazing the stars were in the sky without any city light around. When the boat got into Greek waters, the waves grew bigger and bigger with about 5cm of water splashing in the bottom of the boat. I remember thinking what a long distance we had traveled from Turkey. We were already one and a half hours from the coast and could not yet see Greece in the darkness. What would happen if the boat flipped? I knew how to swim, but I knew I couldn’t swim that distance and I worried for the families and their children. I hoped nothing would happen and we would arrive safely. As the waves continued to grow, one hit the boat and lifted us halfway into the air as another one hit that knocked us upside down. Without even having the chance to take a breath and prepare myself, I was under water. Everything was dark and I felt something above my shoulder forcing me under, preventing me from reaching the surface. I swam to the side to break free and got my head above water to hear everyone screaming for help. The mother of two was floating shoulder to shoulder with her husband far on the other side of the flipped boat, screaming, “My two children are still under the boat!” The boat was half sinking with only the front part floating above the water. I held onto the corner of the boat and tried to swipe my other hand underneath, searching for the children. I moved my hand randomly through the water and grasped tightly when I caught something. It was the little four year old girl I had grabbed. She wasn’t moving, but I thought she was still alive, just unconscious. I pulled her into me. I reached down to take off my shoes because they were slowing down my leg movements to tread water. The boat completely sank and people holding on to it to stay afloat were separated by big waves. Something hit me that I thought was a floating plastic bag which I caught in my right hand. It was the surprise of a lifetime: a life jacket. I didn’t know where it came from as I knew we didn’t have any life jackets on the boat, but I kept it in my right hand and the little girl in my left. I heard the screams of people this whole time, but we were too far apart to see each other. I thought how pointless it would be to stay and scream for help since there were no boats or ships around us. I decided to swim toward Greece. I knew I could never make it that far, but I was trying to convince myself to be hopeful that maybe I would come across some fishing boats out early in the morning who would rescue us. My movement seemed hopelessly slow as I was swimming by just using my legs since my hands were occupied and the waves kept crashing against me. The screams for help became less and less as I started to feel scared of a shark of jellyfish attack. I knew the sea was full of jellyfish, but I wasn’t sure about sharks. After almost two hours, I got tired and almost gave up. I thought about the little girl in my hand and knew I had to hold her up and stay alive for her. However when the morning sun rose, I could see her face and lips were totally blue. I was so broken-hearted and disappointed in myself that I wasn’t fast enough to pull her from under the boat. I had failed this little angel and her mother whom I was so sorry for. I couldn’t let her go even after I knew she was dead. I felt like a disgusting human being and became overwhelmed in the moment with self-hate. I thought if I was going to die here, I would prefer this little angel next to me so I didn’t have to die alone. Every time I was trying to get a little rest and just keep floating, the waves would change direction and drag me back into the open sea making me lose hope that any boat would find me. I was trying to keep swimming, but every muscle in my body was hurting and my knees were in the most pain. The water was cold and I fought the overwhelming urge to fall asleep, remembering that if you fall asleep in cold weather, you will die. I kept moving my legs to warm up my blood and refused to surrender to sleep. Even if I fell asleep for a second and woke up as I went underwater, I would lose the life jacket. I struggled back and forth between life and death. My body was so tired and in so much pain, I thought about just letting it sink. I thought this was the end. But the fear of choking on water in my lungs made me hold on to life. I saw a small ship coming towards me that was close enough where I started screaming and using my legs to make splashes on the surface. I thought he saw me as the ship appeared to stop a little bit, but then kept moving as I was swimming towards it. “Maybe there is a law not allowing any ship to rescues sinking people” I thought to myself as I watched my last hope float away. I had just used all my body power to signal this ship and again accepted my death. As I was ready to let go, another ship came by that was close enough to see two guys standing on it. I yelled to them with my throat hurting, but they didn’t see me. No one was going to see me here. My mind became filled with desperate questions. “Why did this happen to me? Why? Why I should die like this? What have I done to the world to deserve this end? I had never hurt anyone in my life. I was always trying to help people and wished happiness to everyone. Is this how the world pays me back, for me to die like this? Just then, I looked to my right and I saw a ship coming towards me. One last time, I started to scream again and they waved to me that they saw me. It was the rescue team, finally I was safe. My misery ended immediately as finally this hell moment I was living, was over. My feelings of happiness at that point were immeasurable. Even when I knew I would be rescued, I started screaming. I tried to calm down, but my feelings of happiness were immeasurable. They threw me a rope that I had to let go of the life jacket to catch with my right hand. They told me to lift the body of the little girl up to them, but my body was in too much pain to move my arm. A man from the ship came halfway down the metal stairs to pull me aboard, telling me that the little girl was dead as he also pulled her aboard. Three guys that were with me on the boat from Turkey were already on this military rescue ship. Without life jackets, they continued swimming toward the island and were picked up by this ship 2km out. The men told the ship’s crew about the others which they then went searching for. When they rescued me, I was about 5-6km away from the island. On the ship now headed to Greece, I saw another guy and his wife from our boat standing on the deck of the trading ship that rescued them. They had two life jackets that they had bought themselves, but hadn’t been wearing when the boat flipped. I later found out that the husband kept one of the jackets with him and threw the other to the nearest guy to him, which turned out to be me. When they were in the water, they were both stung by jellyfish. The man just got a little sting, but his wife had huge burns covering the whole of her chest. She was suffering in pain and still bleeding from it two weeks after she was stung. I used to go with them to the hospital many times during the day or the middle of the night to help translate from Arabic to English for the doctors. In the end, seven people died, including the whole family of the little girl. Three other men also died. Only six survived. Even now, I have flashbacks every night. When I see the scar on my left arm where the clothes of the little angel scratched against my arm for eight hours in the water, I start crying. I remember the voice of her mother screaming in my ears and feel heavy pain that I failed them. I don’t know what I have done to the world to deserve all this pain in my life, but I just hope I have the chance to see my father in Germany before it’s too late. Two days before I sat down to write this, I got a message that he was in the hospital and they discovered a cancer in his lungs. Here I am stuck in Greece, desperate and heart-broken as his final days tick away in Germany.